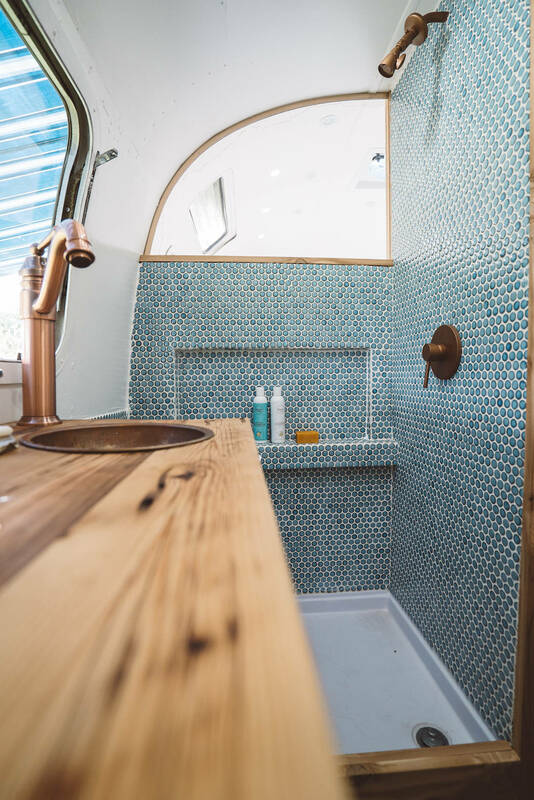 Ever since our Airstream restoration reveal, Siya and I have received hundreds of comments and emails about our Airstream restoration costs and questions about restoring vintage campers. This makes us so excited because it shows us that many of you are interested in this lifestyle. 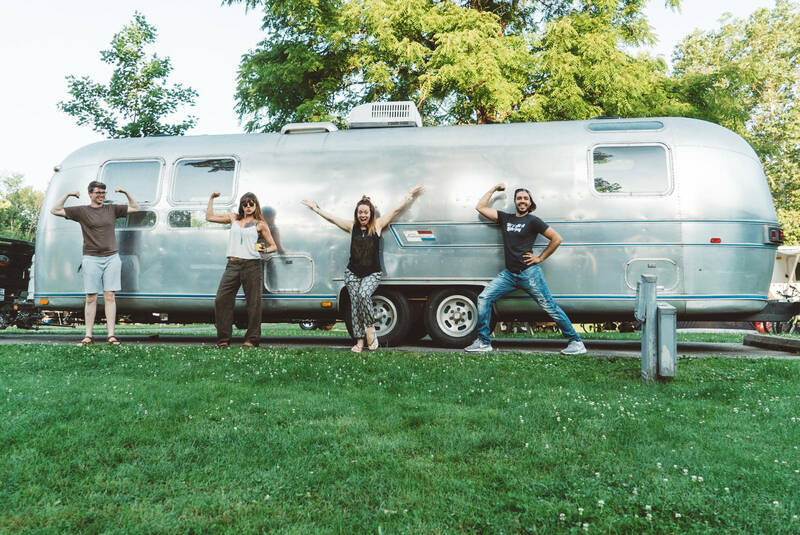 We'd love for you to renovate your own Airstream or Tiny home and join us on the road because this lifestyle is AMAZING! 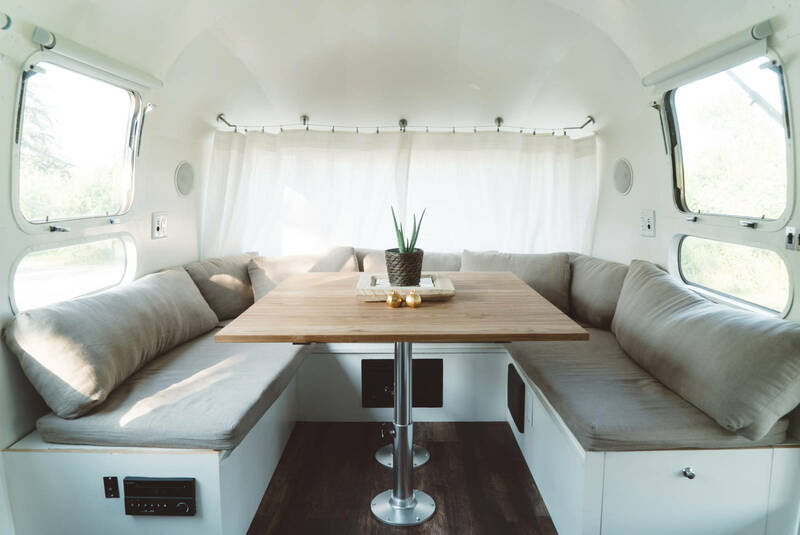 So, due to popular request, and also because we wanted to know what the grand total was ourselves, we present you with our own Airstream Renovation Cost Breakdown so you can help get a better understanding about how to build your own Airstream. In this video, we take you on a tour of each section and breakdown how much EVERY part of our Airstream restoration cost. We share how much we paid for the Airstream, all renovations, labour, and decor. Below, you'll be able to see each individual items we mention in the video broken down into categories. If you click on each link, you'll be taken to the website where we ourselves made the purchase. About 85% of the material we purchased was online through Amazon. Disclosure: We have used some of our affiliate links for the items below. This means that for every purchase made through these links, we get a small kick back which helps us continue creating awesome content for you. Now, let's get into it! 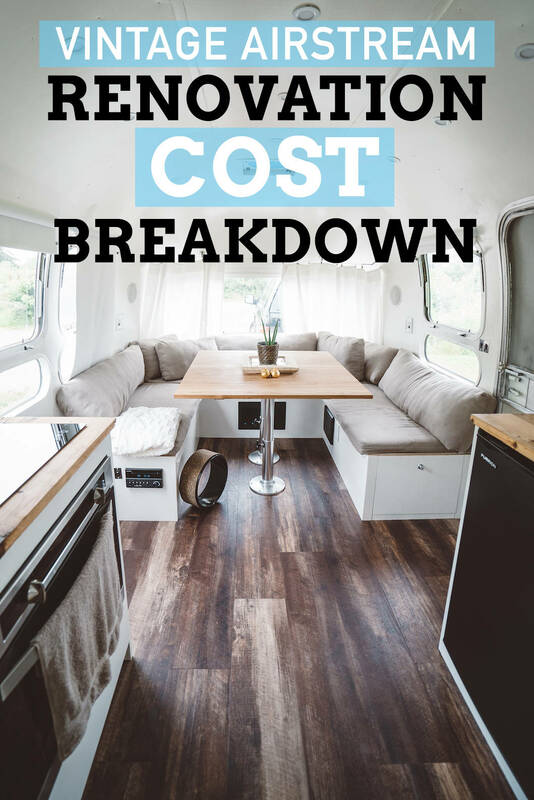 How much did our Airstream renovation cost? We purchased our 1976 Airstream off of a guy we found on Craigslist. It was the second Airstream that we had gone to see. The first one we looked at was really run down on the inside and the underneath was caving in. 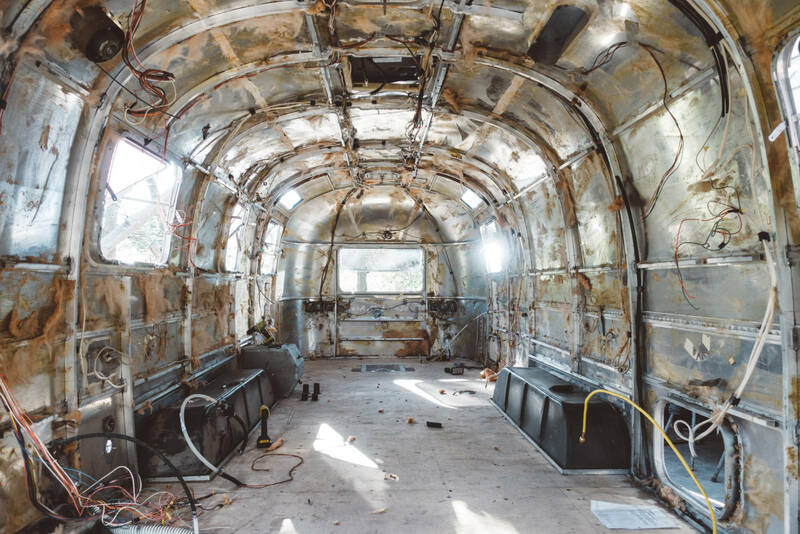 Now, we didn't have much knowledge for what to look for when purchasing an old Airstream, but we did know that if the bottom of the Airstream is caved in, that's a good sign of water damage. Our Airstream (Luna) looked like she was in pretty good condition, but the truth lied beneath the surface. Having said that, the outside shell was in excellent condition, so we were happy with the price we paid; although we could have bargained harder had we known what was to come. Once we started renovating and restoring our Airstream, we came face to face with more and more issues. In the end, we ended up bringing her into an RV shop to have the shell detached, frame re-welded, new subfloors put in, fresh propane lines run and tires replaced. The labour is what cost us the most. We decided to hire experts instead of tackling this ourselves. That way the job would be done more efficiently and we wouldn't have to stop Hopscotch the Globe to renovate. In the end, it saved us a lot of time, stress and money as we were able to work on travel video projects during the renovations. The renovations continued when we brought our Airstream to two other ladies who helped us finish our future home. Kate and Ellen took our design vision and turned it into reality. Together, we purchased all of the items you'll see listed below. Then they worked their magic and really brought everything to life in a 12-week build. 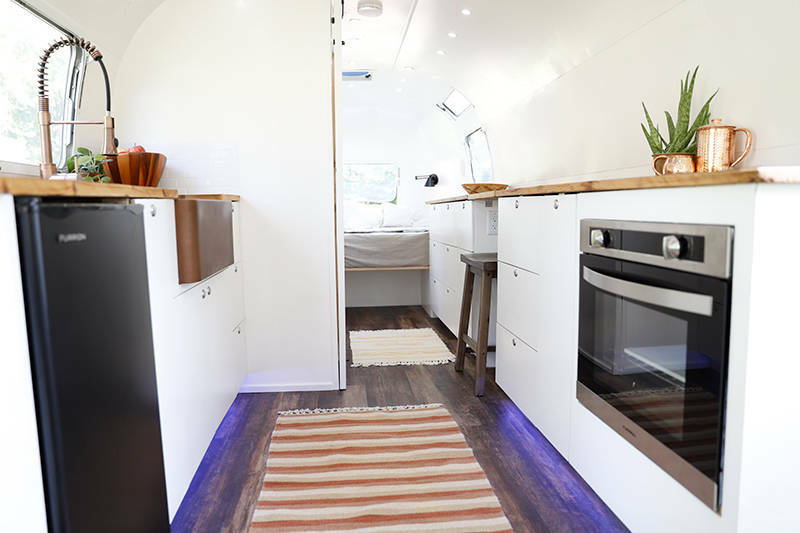 We have a few incredible sponsors who were part of this Airstream renovation including Furrion, Tuft and Needle and GoPower! Therefore, we saved $5983.54 USD reducing our total to $48,324.15 USD (approx. $61,959.96 CAD). 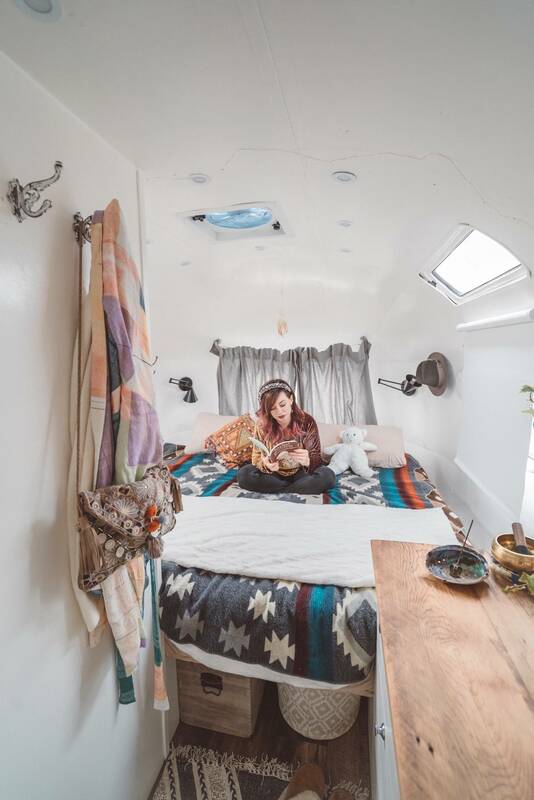 The price we paid to build our own airstream and current dream home is a small percentage of what a two-bedroom house would cost you in Canada/US. 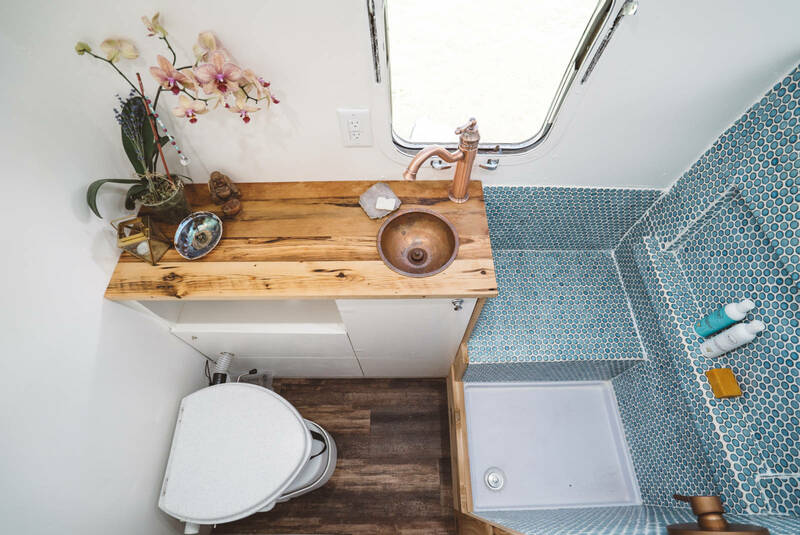 In fact, your building your own airstream or renovating a slightly worn down one can cost even less if you do all of the labour yourself, just know you will end up paying for it with your time. There's also the option of purchasing a brand-new Airstream, but then you're looking at a $200,000 price tag. Since this is our home and we only renovated such a small space, we purchased quality products that will last us a lifetime. In the end, we are ecstatic with how Luna the Airstream turned out! We absolutely love our new home and lifestyle. For two wandering souls that constantly crave the open road, a home on wheels couldn't be more perfect for us. We hope our article and video helped inspired you to try and build your own Airstream. For more tales from the open road stay tuned to our latest travel blog updates and if you have any questions on your own Airstream restoration project, feel free to reach out and connect. Remodel of a house isn’t simple. It includes a great deal of diligent work, innovativeness and association abilities. When done, it isn’t something that can be turned around, so it is basic to screen the work and furthermore, guarantee you have enough power over the procedure to abstain from committing any significant errors all the while. You will require the administrations of experienced painters, roofers, circuit repairmen, and plumbers. Hello Kristen, Enjoyed your Airstream renovation video. Love your spirit, and inspiring embrace of adventure! rehab, and will be nearing completion by mid May. Can’t wait to get started on the road. Question for you folks. Why did you choose to install an induction stovetop? I don’t think solar will power it ..
just shore power or generator. Would you use propane if you could do it over ? 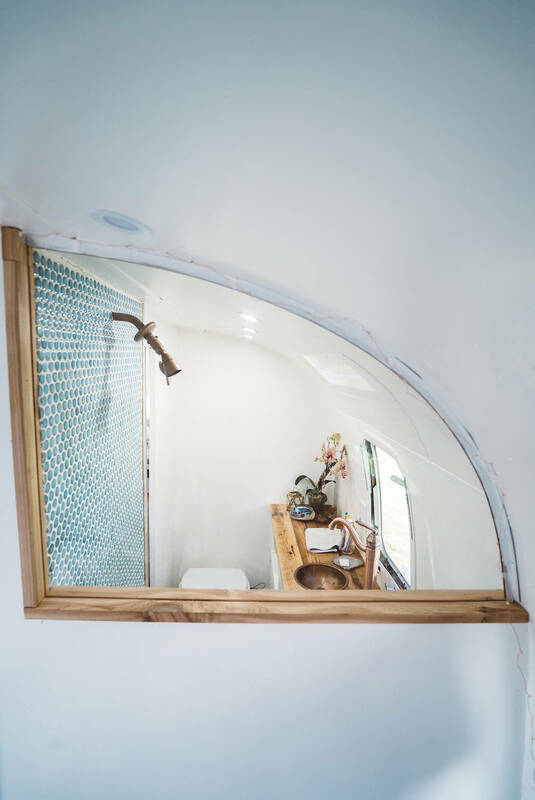 We are a French/canadian family and We would like to know which company did the renovation of your Airstream ? We plan to buy an Airstream with my husband to travel America with our two babies and we mostly love the lounge/dining area of Luna ! Thank you And keep going and living your dreams guys ! Wow. The renovation was a success. Everything seems perfect and way nicer than before. Although its expensive for some but i think its still cheaper than a house that you can take for an adventure. Pictures turned out real good. Congratulations. This is also a decent guide on those who are looking to do the same. That’s so good to know. So many things I’ve learned from your post as I’m facing these kinds of problem. Very lucky to find your post. Thanks a lot for sharing. Eric recently posted..Laminate Vs. Hardwood: Which Flooring Suits Your Home? Thank you so so much for posting your cost overview! It really helps me budget for the airstream I’m purchasing and renovating. 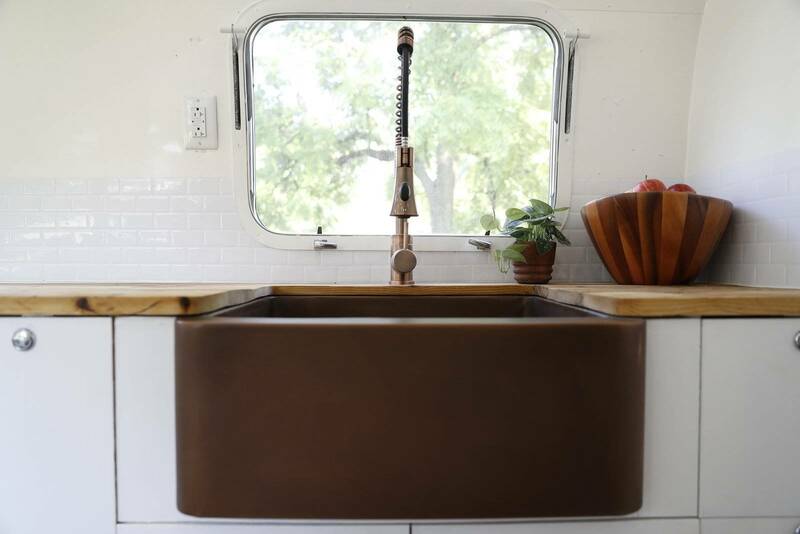 And I’m absolutely IN LOVE with your bathroom design, and I’m probably going to steal it for my airstream. I’m also getting some amazing ideas for storage based on your design. It’s so helpful!! I didn’t see any details for the kitchen and bathroom countertops. Did you make them yourselves? Or where did you purchase them from? I love the deep contrast in color, almost burnt look. Thanks a bunch! Great video, thank you for the cost breakdown! I’m surprised by how much the total was as I have renovated entire 1,500 sq ft houses for less, however, I can see the quality of the materials and things you buy had a big impact on the total cost. I have a question about that big chunk of change for the frame work. How did you know it needed all that frame work and why did it cost so much? My wife and I are actually thinking about doing the exact same thing with an Airstream. Our only worry is that if we decide to sell it at some point, we won\\\’t get our money back. Do you think you would sell your Airstream now for $54k and recoup your cost? Have you had any offers? Have you seen any other Airstreams as nice as and like yours sell for what you put into yours? I think we can sell it for more. The great thing about Airstreams is their value increases if you keep them in good shape. Ours is basically brand new and has a one of a kind look, so we can sell it for more. We’ve had people ask to buy it but we aren’t looking to sell. We are going to rent it out eventually though. I’ve only seen a couple of others as nice as ours and they were all rebuilt by the owners. It’s definitely an investment but we are happy we did it. It is a great remodeling tutorial to old thing to transfer new model or tools. A complete guideline you provide. Such an excellent blog post, I have already bookmarked this blog. But I am happy to see your checklist that gives me minimum idea an=bout remodeling my old bathroom. Thanks keep it up. Hey Sarah, I must appreciate your taste of the renovation. Everyone is looking for cheap solutions everywhere, but you are not like them. I thought the total cost was more than 70K. But I was surprised to see its under 60K. I really loved the bathroom renovation expecially the use of the compisting toilet and bronze shower heads. Goodluck for your tiny home. What an excellent project. I love anything vintage. What an amazing makeover! I have a 1972 31′ LandYacht that I purchased 18 years ago for $1,500.00. It had belonged to someone from Pennsylvania who intended to visit Central Florida regularly and had parked it on a large property that was heavily wooded. Sadly they passed away before being able to use it a second time. It Sat for years and the squirrels enjoyed it very much. Long and short of it is they ate the upholstery, wiring and made several nest. But all considered the refrigerator stove oven and plumbing were fine. So my husband spent several months taking out the damaged interior, replaced the wiring throughout cleaned it up and refurnished it. The AC even worked at that time. We spent weekends in it on our 10 acre property and lived in it full time for several months while building our house. It has survived a forest fire which engulfed it totally with no damage except for the tires. And most recently hurricane Irma except she ripped off the original awning. It didn’t get flooded but was surrounded by water for weeks causing mold. So once again any and all fabrics had to be removed and it thoroughly cleaned inside to remove the mold. Which was easier that expected actually. The AC unit was ruined sadly. Some of the cabinets had lived as long as they could and we have taken some out along with the two beds in the center. We put a window AC unit in for the time being and I use as my space for making things and restoring vintage items for my Etsy shop and it’s just a cool place to hang out. I love the thing and at times I think I want to sell it but then getting it so cheap and being that my husband is more than handy and I have no labor cost what so ever. He has the tools and knowledge to do it all and is willing. After seeing the cost breakdown and the fact that much is labor and the resale prices… I think I would be crazy to sell it and buy new when he retires in five years. If nothing else it could be parked at the beach and rent it out through Airbnb. Vintage campers are getting very popular for that. So thank you very much for this valuable information. I have certainly learned that the $3,000.00 I was going to ask for it is way too low. So I think we will refix it and relike it and save a ton of money. Hi Lynette, I think you’re smart to keep it. I moved to a tourist town in the mountains and the rent was pretty high, plus I couldn’t risk damaging the carpet and hardwood flooring, so I wasn’t doing any artwork with all the space I had. So, I bought a 1979 Sovereign Land Yacht for $9,500 and it was current being used, towed, and everything worked. Wiring had already been updated, new axles and tires, and new ceiling fans and air conditioner. 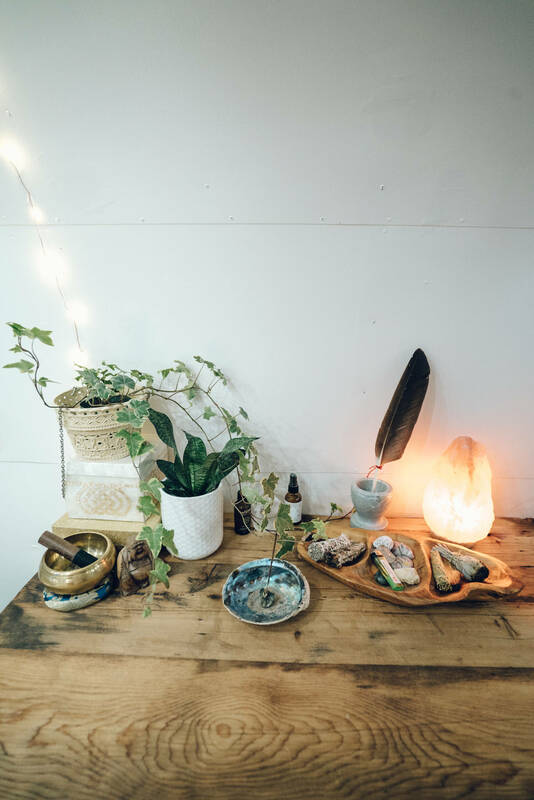 I use Eden Pure heaters and, honestly, I can run a hair dryer – a lamp – and the heater without blowing a fuse and I know that from experience. There were problems, so a friend who had owned one replaced some flooring edges that had gotten wet, fixed some of the windows so they open/close better, and re-built one fixed window that was holding water – fortunately … NO MOLD. I’m painting the interior and keeping all of the original layout for now. Except, I tore out the bed, got rid of the couch, gross looking sliding doors and that kind of thing. 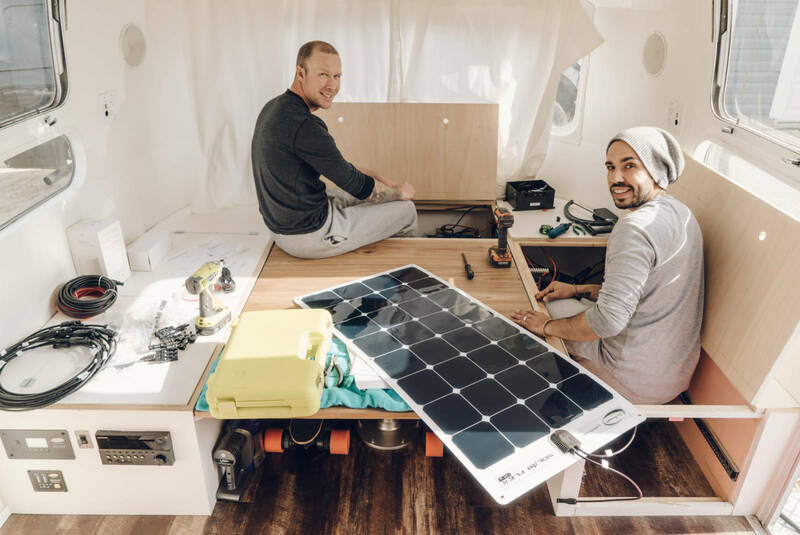 I’ll do solar and a composting toilet next and I even found a wood stove from a Canadian company that makes them for sailboats (well, this is a yacht after all). I put down cheap carpet because I had to leave to travel for work and I’d already given notice on my apartment. I’m going to have the flooring completely replaced with hardwood and commercial carpeting. I currently have it in a mobile home park, that is well kept and has a few RV spots. This is much less expensive than the RV parks in the area, which are always full. I’m looking for unrestricted land, so I can add studio space and a garden and whatever I want, but for now this is extremely comfortable, easy to manage, and very affordable. I’m much older and didn’t want to be saddled with a mortgage so when I retire I can have a home base and travel too. I love the Airstream because they don’t rust and they’re easy to maintain and the rain is absolutely delightful. I think they’re a bargain and cost less than tiny homes, unless you can build one yourself. What a great office, work space you have there! Hi Marcedys. The table top was just a slap of wood that was cut. I’m not entirely sure which shop we got it from. But it was just from a place that sold slabs of wood. Hi when i am searching about solar panels then i reached your website your site have such nice and helpful content.Thanks for sharing such kind of informational content.i am happy to reach you. Love, Love, Love your airstream! We have a ’64 that we are just starting on and planning on doing most of ourselves. Yours is such an inspiration. I have a question on your tile shower. How is it traveling? I want to tile ours and have heard you need to use a flexible grout. Have you had any cracks you have had to repair? Are you stationary for a long time or always on the road? Also are those real tiles as the kitchen backsplash? Hi Laurie. 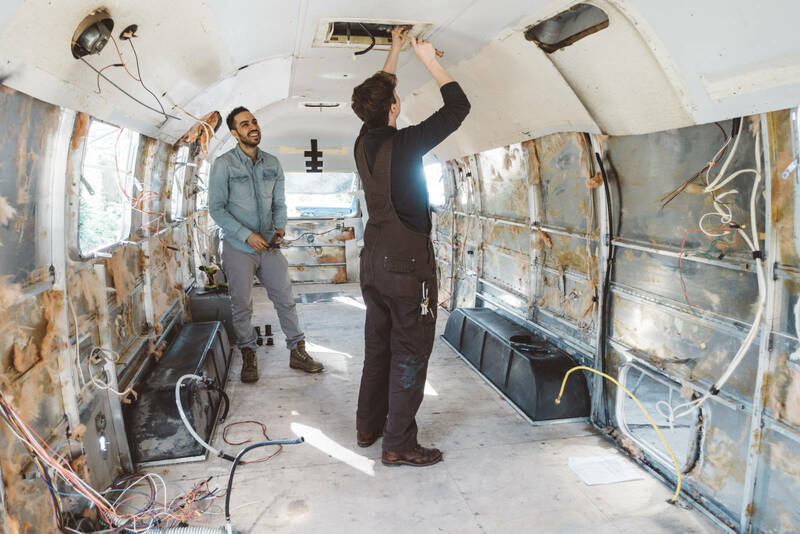 That’s so exciting that you’re going to renovate an Airstream on your own. What a project that will be, but so rewarding in the end. We love our tiles and haven’t had any issues at all. We are always moving. We just travelled 8000 km from Ontario to California and the shower is just the same as it was before we left. In the kitchen, those aren’t real tiles! They sure look like it even if you look super close. They are stick ons. We love them. They weigh nothing, look great and are super easy to clean. What size airstream is it? I\’ve watched three or four of your videos this morning trying to figure it out but you didn\’t say (so far! maybe I should just keep watching?] We have an older airstream International which was partially (terribly) renovated when we got it so you\’ve inspired us to maybe do ours over in the near future. Ours is about 29 or 30\’. Keep on doing what you do! Hi Vicky! Thanks so much for your support and watching our videos. We will be uploading new Airstream videos each week, so stay tuned for those. We have a 1976 31-foot Airstream Sovereign. That’s really exciting that you’re renovating yours. OMG, white and grays are looking awesome. I am also planning to get an RV for my family of 3. Thanks for the cost breakdown and design idea. I love it. You are very welcome! We love our home so much. I hope the breakdown helps you with yours. Great idea to post the real numbers, thank you, I’ve always been curious. We considered a renovation but we’re not super handy so we’d have to hire the work out. Instead we purchased a new 2018 international signature 27′ for $86k. I’m curious about the $200k figure you quoted for a new one? It’s great to see a breakdown of costs. 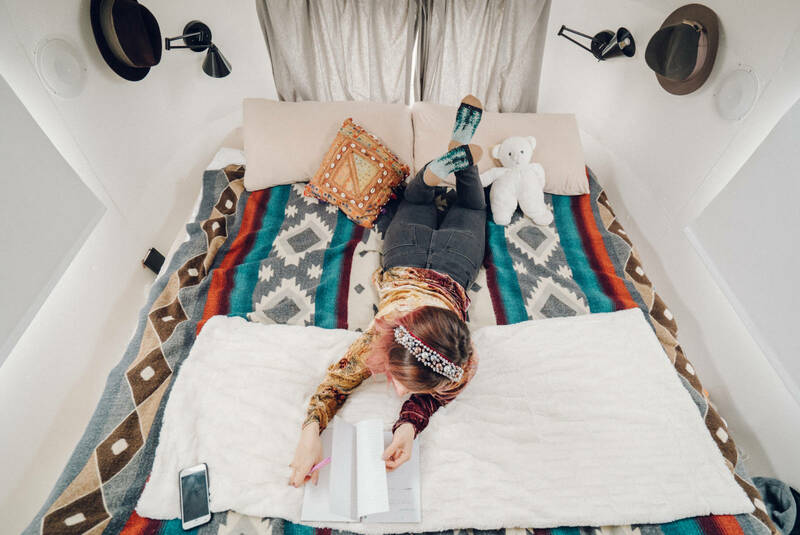 We aren’t likely to live in an airstream anytime sooN as we are pretty settled in a home that we love. We also have 4 kids, so it’s not so easy. But, my husband and I have dreams of traveling a lot once the kids are all grown up. Maybe an RV of some kind is in our future.